Decomposition of organic matter by a variety of microor ganisms results in the release of N in the form of ammonium (NH^), which is either utilized by the microorganisms or diffuses back into the soil or water. Under highly alkaline conditions, NH^ is transformed to ammonia (NH3) and released to the atmosphere as ammonia gas. Under aerobic (well oxygenated) conditions, the NH^ — N is converted into nitrates (nitrification) by microbes such as Nitrosomonas and Nitrobactersp. It has been recently discovered that under anaerobic conditions, NH^ oxidation (anammox) may occur utilizing the nitrites and result in the release of mole cular N2 (gas). The nitrates are readily reduced by microbial activity (e.g., by Pseudomonas sp.) under anaerobic (oxygen deficient) conditions into molecular nitrogen or nitrous oxide (N2O), which are lost to the atmosphere. Microbial transformation of nitrates may also result in NH^ formation (dissimilatory nitrate reduction). Whereas most microbial N transformations conserve N within the soil-water system, denitrification is the major and most important mechanism for N loss from the wet lands. It is favored by large organic matter load or accumulation of peat that creates anaerobic conditions. Frequent wetting and drying cycles, redox gradients along the flow pathway within the wetland, and the occur rence of an aerobic-anaerobic interface near the wetland soil surface promote rapid N loss from the wetlands by coupling the nitrification and denitrification processes. 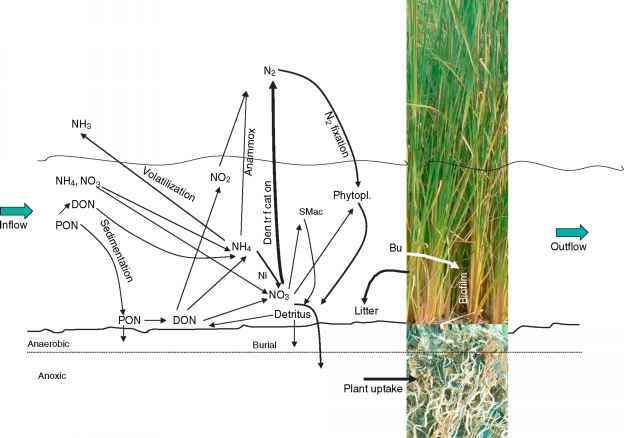 Two additional processes further affect the net loss of N from the wetlands. Under favorable conditions, sub stantial amounts of nitrogen may be added to the wetland systems through nitrogen fixation by various organisms, particularly the cyanobacteria (blue green algae) - both green living and symbiotic (e.g., with Azolla sp.). The decomposition of plant litter depends upon, among other factors, its N concentration. As N compounds are highly labile, they are readily leached out and therefore, further decomposition occurs only after microbial immo bilization of nitrogen. Several other nutrients such as calcium, magnesium, and sulfates are also removed in the wetlands through plant uptake. Plants accumulate significant amounts of these substances (Table 2) and also transfer them to animals at a higher trophic level. Under conditions favorable for rapid photosynthesis, submerged plants and algae may cause precipitation of calcium as carbonate. Under anae robic conditions (redox <-200 mV), the sulfates are reduced by microbial activity to H2S which may escape to the atmosphere or form sulfides with heavy metals. Wetlands are known also for their potential to remove heavy metals from inflowing wastewaters. Heavy metal species occur in particulate or dissolved forms. Settlement of particulates, adsorption and complexation with dis solved organic substances play an important role in the removal of heavy metals. Under anaerobic conditions, heavy metals such as Fe, Zn, and Cu precipitate with sulfides and are retained in the sediments. Plant uptake also contributes to a reduction in the concentration of dissolved heavy metals. However, few plants accumulate heavy metals in significantly large concentrations (Table 4). The uptake is also determined by the concen tration of available heavy metals in the wetland soils and water. Translocation of the absorbed heavy metals from the roots to shoots, leaves, and other storage organs is highly variable, and generally, most of the heavy metal absorbed by the plant is accumulated in the roots which cannot be readily harvested. The retention within the wetland varies considerably (40-80%) for different heavy metals. Thus, whereas the heavy metal concentra tion is reduced in the outflow, the wetland soils may soon become saturated with heavy metals and their efficiency may decrease rapidly. Wastewaters, particularly those with dissolved or sus pended organic matter, harbor a large variety of pathogenic organisms which are often of greater concern than the nutrients. These organisms include bacteria, viruses, fungi, protozoa, ciliates, etc. Wetlands remove them significantly by (1) adhesion, aggregation, and sedi mentation along with other particulate matter and (2) creating environmental conditions that are detrimental to their survival and growth. Changes in the temperature, pH, dissolved oxygen, and salinity affect their growth. Most pathogenic organisms do not survive under aerobic conditions, and the reduction in the organic substrates directly affects their growth. Competition with and predation by other organisms occurring in the wet land also eliminate many pathogens. Wetland vegetation plays an important role by providing conditions for sedi mentation and adhesion to the biofilms, by oxygenating the environment, and by promoting growth of predator organisms. Secondary metabolites such as phenols pro duced by certain plants are also toxic to some pathogens. As described above, the main role of the wetland plants is certainly the removal of the nutrients for their own growth, but they contribute to nutrient transformations by abetting in the physical, chemical, and microbial pro cesses. They offer mechanical resistance to the flow, increase retention time, and facilitate settling of sus pended particulates, besides reducing re suspension and mixing in the water column. Plants provide large surfaces for the growth of biofilms (comprising of bacteria, algae, and microfauna) which in turn enhance the filtration of particles from the water column. Rooted emergent plants improve conductance of water through the soil as dead roots create spaces. All wetland plants contribute organic matter which supports the microbial communities which participate in various nutrient transformations, especially denitrification and sulfur reduction. Most of the emergent plants (particularly the reeds, cattails, and sedges) actively transport oxygen to the anaerobic layers of the soil. It helps the oxidation and precipitation of heavy metals on root surfaces. Submerged plants directly oxygenate the water column, whereas most free floating plants also transport oxygen to the water column through their roots. The photosynthetic organisms in the biofilms also contribute to oxygen production, and the nutrient uptake and transfer to higher trophic levels. Emergent, floating leaved, and free floating plants shade out surfaces prevent ing algal growth and may eliminate oxygen exchange -thus enhancing reduction reactions. Algae contribute to wastewater purification as in oxidation ponds, by providing oxygen. diurnal and seasonal variation) which regulate plant growth as well as nutrient transformations. In the tropical regions, besides large water level changes, higher tem perature is an important factor that promotes microbial activity, reduces oxygen solubility, and hence helps quick development of anoxic conditions. High temperature favors plant growth, and the growth generally occurs throughout the year. In temperate climates, winters with freezing temperature do not allow plant growth and hence lower their wastewater treatment potential. Various wetlands differ considerably in their potential for improvement of water quality. Typically, the bogs are rainfed and nutrient deficient and therefore respond to wastewater inputs by rapid changes in species composi tion. The peat in the bogs initially facilitates the removal of P and heavy metals by adsorption and that of N by denitrification. Littoral marshes and floodplains with her baceous vegetation and mineral soils are most effective in improving the quality of wastewaters passing through them. Studies have shown that the swamps in Mississippi Delta (Louisiana, USA) are able to reduce the nitrate N and phosphate P load of inflowing waste waters by up to 90% even after several decades. Coastal marshes, mangroves, and sea grass beds are limited by the salinity and periodic inundation by the seawater. An experimental study in southern China showed that the sewage discharged into a mangrove did not have signifi cant adverse effect on the mangrove, whereas nutrients accumulated in the sediments, thereby indicating the potential to receive wastewaters. Natural wetlands in the Baltic Sea drainage basin have been reported to retain annually about 5-13% nitrogen of the total natural and anthropogenic load entering the Baltic Sea. However, the ability ofthe natural wetlands to treat waste water is in most cases limited. Nutrients do not always support extra growth: excessive supply of nutrients by prolonged discharge of wastewaters may have serious adverse consequences for the natural wetlands. For exam ple, P loading from agricultural runoff in the Everglades over several decades has resulted in a shift in species composition - from Cladium to the preponderance of Typha. Another study in New Zealand recorded changes from a species rich Baumea-Isachne sedge grass community to a simpler Eleocharis sphacelata-Typha orientalis commu nity. The decline of reeds (Phragmites autralis) along the shores of several European lakes (e.g., L. Constance) has been attributed to gradual eutrophication, among other factors. Most wetlands are adapted to specific hydro logic regimes with species of plants as well as the invertebrate fauna depending upon the wet-dry cycles, depth, velocity (residence time); therefore, hydrological alterations through regular discharge ofwastewaters result in significant changes in community structure and functions. Although wetlands may remove and store substantial quantities of nutrients, they also potentially release a sig nificant quantity, especially nitrogen to the downstream ecosystems. Nutrients are released during death and decay, and a significant amount is recycled through internal cycling between belowground and aboveground organs, thereby lowering the effective nutrient removal from the wastewaters. Repeated harvests of aboveground organs at shorter intervals often help remove more nutrients from the system but deplete the belowground organs of their reserves which may consequently affect the vegetative growth. Decomposition of belowground organs is generally slow and hence builds up organic matter in the soil. At high loading rates, the wetlands become soon saturated with nutrients and the treatment efficiency declines. The transformation of inorganic nutrients to organic forms results, however, in a more gradual release and a general decrease in bioavailability for downstream waters. This buffering of nutrient pulses in the watershed by the wetlands results in a considerable ecological stability of the associated open water systems. The understanding of various physical, chemical, and biological processes in the natural wetlands, various fac tors influencing these processes, the relative importance of various plant species, and the overall potential and problems has been utilized in designing different types of constructed wetlands for the treatment of a variety of wastewaters. These wetlands, based on a few species only, are designed by selecting suitable substrate, loading rates, residence time, and flow paths in order to maximize the treatment efficiency. For more details, see Constructed Wetlands, Surface Flow and Constructed Wetlands, Subsurface Flow.